Our website is a small but integral piece of our entire local marketing solution. You simply choose a category (or multiple) in which to feature your business listing and we'll take care of entering all of your information; company description, logo, location, hours of operation, web address, email - even, photos, banner ads and links to your Blog, Facebook, or Twitter pages! Our first goal is to drive traffic to your business - online or off. As a result, some customers will find what they need about your business directly on our site, while other customers will continue on to your site to get even more information. While we provide businesses and loyal locals with window decals, bumper stickers, and t-shirts - it is about much more than just that "warm-and-fuzzy" feeling. These tools are a small but very deliberate part of building an effective grass-roots campaign to support local business. 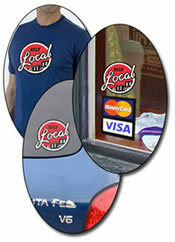 It is our way of making RelyLocal the new "Good Housekeeping Seal of Approval" for local businesses in the Bend area. RelyLocal isn't just about what we can do for you, it's about what you can do for your community. At least 90% of your membership dues stay in the area to help grow our community campaign to reunite local customers with their local businesses. We don't view our business members and web users as clients and customers, we view them as partners! Get involved, make a minimal investment in Bend, and you'll receive a lot more in return than just more clicks to your web site. We are here to help!